No other event features a gathering of so many overland legends, VIPs, authors, and experts. Overland Expo WEST offers more than 400 session-hours of incredible programs brought to you by over 140 instructors and presenters from around the world. Graham Jackson & Connie Rodman ~ Global overlanders, guides and trainers. In 2014, a few well-traveled and experienced gents had the idea of getting the best expedition team in the world together and offering training and expeditions. 7P International was formed. They provide world-class instruction with ex-military and globally experienced instructors in all types of terrain. Their training covers technical driving and recovery, as well as the non-technical elements of overland travel from logistics to navigation. In addition to instructing at Overland Expo, they offer boutique, guided trips to some of the most challenging and interesting destinations in the world including the Central American jungle and the deserts of Africa staying at a combination of remote camps and luxury lodges. Jim Hyde and Team - Anchoring our motorcycle trainings, RawHyde Adventures will team up once again with BMW Academy to offer the best in adventure motorcycle education and a chance to test-ride the latest bikes. 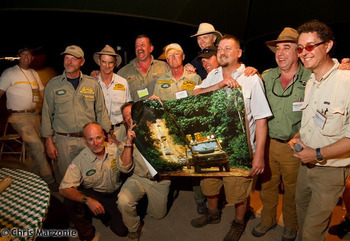 CAMEL TROPHY REUNION, 2011 OVERLAND EXPO; THE TEAM SIGNED A POSTER PROVIDED BY PETE SWEETSER (FAR RIGHT) AND AUCTIONED IT FOR A CHARITY CAUSE. Ted Simon, Jupitalia.com—twice round the world by motorcycle, author of the bestselling Jupiter’s Travels, Riding High, Dreaming of Jupiter and many more motorcycle tales. Sam Manicom, Sam-Manicom.com—8 years around the world, author of adventure travel motorcycle books from around the globe, Into Africa, Under Asian Skies, Distant Suns and Tortillas to Totems. Simon & Lisa Thomas, 2RideTheWorld.com—this traveling duo is still on the world's longest motorcycle journey by a team. Check out Lisa's new cookbook for adventurers, Dirty Dining. Andrew Pain, MinimalMotorcyclist.com—traveler and author of multiple motorcycle travel titles including Going Small, and Ten Things You Should Know Before Buying an Adventure Motorcycle. Alison DeLapp, AlisonsWanderland.com—author and photographer of Chaos in Harmony and How Far is North? Graeme Bell, A2AExpedition.com—professional full time overlander and author of We Will Be Free, a declaration of independence and Travel the Planet Overland, a guide. Sarah Leamy, Dirt Roads And Dogs—author of four road-trip inspired novels. Be sure to check the Author's tent at Overland Expo 2016 WEST to find the latest in travel stories and adventure tales. Janna Hitchcock & Wilderness Medics, Inc.